Today I'm pleased to share a guest post by Paul Laughlin. Ten years ago, in 2005, a group of people working in the field of knowledge management across the UK and the USA coined the phrase "narrative leadership." So was born what might appear to be another fad in the field of leadership. Plenty of books were written and conferences attended. But once the dust had settled and HBR et al were talking about other topics, positive progress had been made. More CEOs made use of stories to communicate compelling visions. More innovative businesses brought together multidisciplinary teams to share knowledge through storytelling. One of the leading lights of this movement was a consultant by the name of Stephen Denning. Now, a decade later - amid the buzz about big data, decision science, content marketing, and disruption - you don’t hear many people talk about narrative leadership. But a focus on storytelling is reawakening. In the early 2000s, I had the pleasure of experiencing a leadership training course that included material from Stephen, and I was captivated. The concept that humans are innately receptive to the telling of stories as a means of effective communication was self-evident around the world and in so many different cultures. It was also captivating to imagine how the dull world of working in Financial Services could be enlivened by this more holistic style of leadership. 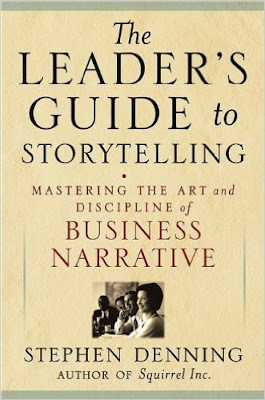 The book I recommend you read on this topic is “The Leader's Guide to Storytelling“ by Stephen Denning. Its subtitle gives a clue to the style of this tome: “Mastering the art and discipline of business narrative.” Whilst not always an easy read, partly due to the depth of what is shared and partly to the polymath nature of the author, it is a treasury of practical advice on this challenge. It's one of those books I’ve returned to several times over the years to refine my skills and to pass on storytelling tips to customer insight analysts and leaders alike. It is structured into three primary sections: part one explains the role of story within organisations; part two unpacks eight narrative patterns (story templates) that help with different leadership challenges; and part three covers what Stephen calls ‘putting it all together’ or the challenge of how to apply this approach. Creating and Sharing Your Vision: A future story. In each of these chapters, Stephen digs beneath the surface of the challenge to help leaders understand which approaches work and which do not, plus the reasons for such behaviour. He compliments this with real life examples, practitioner tips, and a template for taking the storytelling approach recommended. 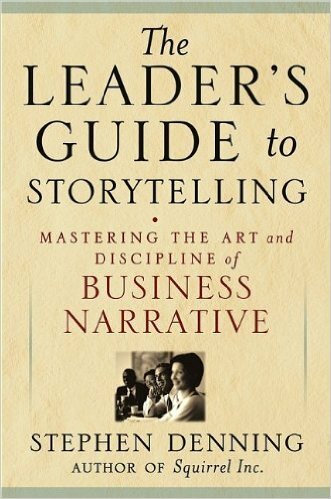 In that sense, this is much more than a book about storytelling; it is just as much a leadership textbook. However, true to its raison d’être, it delivers bite-sized leadership advice through the medium of stories and examples. Although it might sound like the most-relevant chapter for Customer Insight leaders is Chapter 6 above, Sharing Knowledge, in fact all the leadership challenges above appear at different times for insight leaders and their teams. That knowledge sharing chapter is also more focused on how to convey in a more interesting way rather dry technical expert knowledge learned through experience. The most relevant of all the stories to insight leaders and the one Stephen suggests leaders master first is, in fact, the first one. Communicating insights in a positive way that motivates action in the business is perhaps their greatest challenge and one where a well-crafted story can really help. Which brings us to the closing part of this book. Across two chapters, one focused on the challenge of how established businesses can innovate and the other on a "different kind of leader," Stephen passes on a great deal of leadership wisdom. The final chapter on being a different kind of leader is particularly inspirational and draws together numerous strands from throughout this book (our story). He advocates an interactive leadership model, one where the leader participates, connects, and communicates with different types people as peers; open to fresh ideas. If you exclude the manipulative models of leadership (from corrupt bureaucrats to spin doctors), he suggests two authentic models of leadership: the first is the traditional command and control, or Napoleonic model, of leadership; the second is an interactive model using narrative and genuine conversations or Tolstoyan leadership. Despite being 10 years old, this book is a real gem. In today’s business world, with the challenges of content marketing, customer conversations, colleague motivation, and continual innovation – Stephen’s advice sounds more relevant than ever. I heartily recommend this treasure chest as a book for every Customer Experience and Customer Insight leader. Paul Laughlin has over 20 years experience of leading teams to generate profit from analysing data. Over the last 12 years he’s created, lead and improved customer insight teams across Lloyds, TSB, Halifax and Scottish Widows. He’s delivered incremental profit of over £10m pa and improved customers’ experiences. Need a CX Coach or Speaker? I'm Happy to Help! Send Me a Note! Stay tuned! More to come! Would you like me to speak at your event or conduct a workshop for you? Who's Your Customer Experience Custodian? Is It Time to Create a Hassle Map? © 2011-2019 | CX Journey Inc. | All Rights Reserved |. Travel theme. Powered by Blogger.